Born in Syracuse in Sicily in the 280s, there are several legends surrounding the story of the Holy Sancta Lucia (eng. St. Lucy). Although it remains unclear what actually happened to her, it is however certain that she suffered martyrdom December 13th, somewhere between 303 and 310 AD. The various legends say that Lucia prayed to God that her mother, who was terminally ill, would get well. When her prayers were granted, Lucia devoted herself to God, swore to live in chastity and used her dowry to bring food and supplies to the impoverished people of Syracuse. In order to have her arms free when she was going down the dark hallways in Syracuse, it was said that she wore a wreath of candles, earning her the epithet, “the luminous". Some say that it was a scorned suitor who allegedly reported her actions, after having been repeatedly rejected by the beautiful girl. In a time in when Christianity was banished, and devoted Christians were persecuted, this was a severe accusation. The city’s governor promptly commanded that Lucia should be burned at the stake, unless she voluntarily chose to renounce her faith. The girl refused this “offer”, yet when the day came, the fire did not touch Lucia, and several attempts had to be made before the executioners succeeded in ending the life of the poor girl – eventually she was killed by a sword through her throat. After her passing, Lucia was canonized, and to this day the martyrdom of Sancta Lucia is commemorated on the 13th of December. 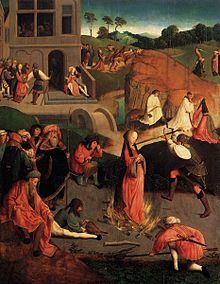 Master of the Figdor Deposition (1480–1500, The Martyrdom of St Lucy, detail. Formerly part of a wing of an altarpiece. In Scandinavia, the anniversary of Lucia was established after the implementation of Christianity – here however, the typical elements of the catholic celebration were fused together with ancient Scandinavian traditions. The celebration of the winter solstice had taken place already among the Norsemen, and many of the Norse traditions and conceptions were continued for the generations to come. In the Nordic lands, December was known to be the darkest time of the year and, giving the circumstances, it was only natural that the common belief system was characterized by the long ranging darkness. The night between the 12th and the 13th was believed to be of particular importance, being the longest night of the year, and therefore a night when powerful and supernatural forces were at work. According to the folk belief, this was for instance the only night of the year when animals were able to talk to each other. After midnight, the barn became a bustling social “hot spot”, in which all the animals were finally able to catch up on their gossip. This might also be an explanation why Lucia was believed to be a part of the dark forces dominating this particular night. In addition, a confusion of St. Lucia ("the luminous”) and the diabolic Lucifer ("the bringer of light") arose in Norwegian and Swedish folklore, as a creature known by the name of Lussi. It was also on this particular evening the beginning of Christmas was initiated, and it was therefore important that people were well underway with all the Christmas preparations. Threshing and spinning should already have been completed, and Christmas baking was expected to be well underway. Late at night between the 12th and 13th of December, Lussi came with an entourage of subterranean beings to ensure that all activities were on schedule. In this sense, Lussi may perhaps best be described as contemporary labor inspector, which in fact gives her something in common with the nisse. And as with the nisse, Lussi was also known for her erratic nature – if people had neglected their “to-do list”, all hell would break loose. Lussis fury would be inevitable, and she would press her white, distorted face against the windowpane, shrieking out her disapproval. At other times, she could also enter the house through the chimney, or she would simply tear down the entire chimney. The most unfortunate ones could even risk getting abducted by this creature, and led far away. All had to watch out when Lussi came stirring, bewitching and startling poor and rich alike. Lussi langnatt (eng. 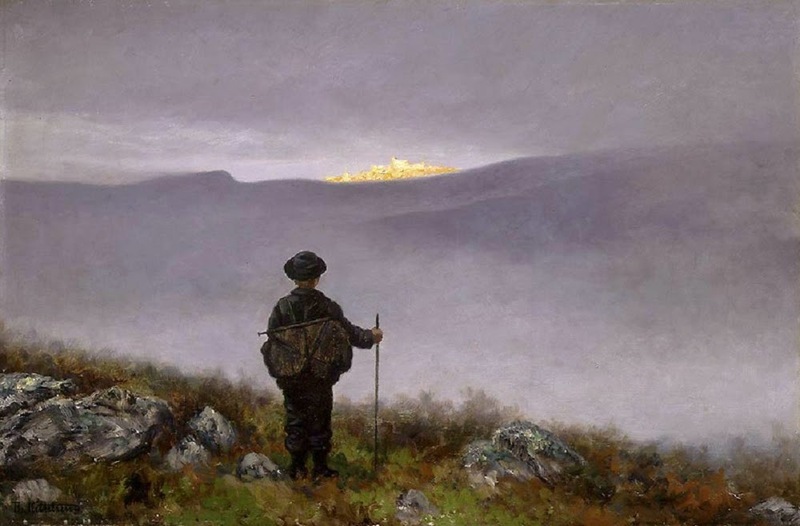 ‘the long night of Lussi’), was therefore not an evening that was much looked forward to, and if possible, most people preferred to remain indoors. Luckily, the Lucia known in Scandinavia today, is quite different from the previous creature of Lussi. In Sweden in particular, the tradition of celebrating “luciadagen” is deeply rooted, and may have arisen with sailors who brought this Italian custom to the Nordic lands. Early in the morning, the oldest daughter of the house would bring her parents breakfast in bed, in the form of coffee, hot mulled wine and traditional “lussekatter” (Saffron Buns). This is a custom that dates back to the 1880s, and originally, she would be wearing white, with a candlelit crown on her head just as Lucia. The first recorded appearance of a white-clad Lucia in Sweden was in a country house in 1764. The custom did not become universally popular in Swedish society until the 1900s, when schools and local associations in particular began promoting it. Around the 1930s, we meet the first modern Lucia-processions in the streets of Stockholm, with the luminous Lucia in front, followed by an entourage of girls and boys dressed in white. Originally, this was actually a publicity stunt of one of the city's daily newspapers, yet it became so popular that it quickly spread to several parts of the world. Nowadays, the Lucia-celebration remains a widely popular happening throughout Scandinavia, and during the last decades, it has increasingly become a celebration for the youngest. In schools, kindergartens, hospitals and other public institutions there are processions with children dressed in white, carrying candles baskets of lussekatter in their hands. In Sweden, even a national Lucia is proclaimed, and each town and village elects their very own Lucia. It is quite a sight, standing in a pitch black room when a Lucia-procession enters singing, wearing long, white robes with burning candles in their hands. In front we have Lucia herself, wearing her candlelit crown and a red ribbon around her waist, accompanied by a number of “handmaidens”. Though many songs are dedicated to this celebration, the one most commonly used throughout Scandinavia was really a Neapolitan folk song. The earliest version dates back to 1835, when the Italian composer Teodoro Cottrau translated the text from Neapolitan dialect to standard Italian. Today, it remains as the official song of the Lucia-celebration, known by Scandinavians by heart. 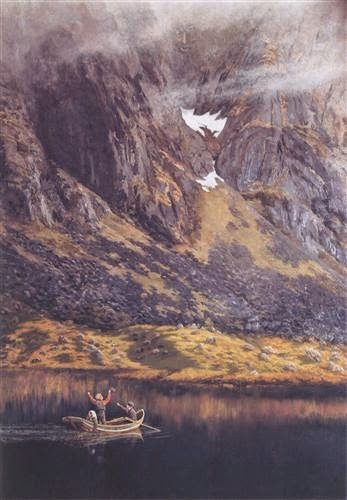 It is a song that truly captures the heart of the celebration, and bears witness of the brighter, warmer days to come. 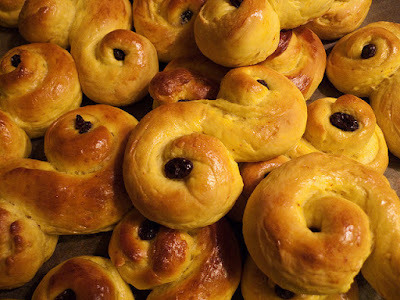 Wish to try out the traditional lussekatter (Saffron Buns)? The concept of December 13th as “the longest night of the year” is also a symbol of the constant battle between the light and dark forces of the world – the December solstice may in this sense be consider as a mighty metaphor that lightness eventually prevails. The traditional pastry lussikatter, which holds such an important part of the celebration of Lucia, may actually be consider as an extension of this metaphor. Lussekatter are baked with saffron, which color is considered as a representation of the sun and the light. Furthermore, the spiral forms of the pastry represent the ancient symbols of the solar, as well as of life itself. Ørnulf Hodne (2007). Jul i Norge. Gamle og nye tradisjoner. Cappelen.